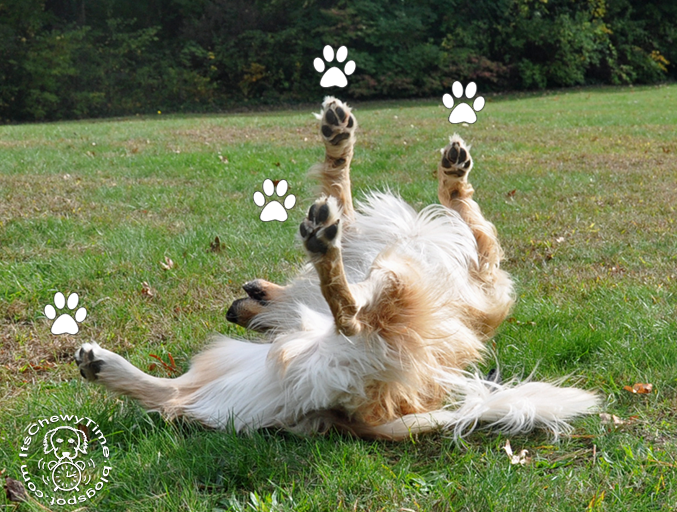 When shopping for dog food or treats, do you look for human-grade, natural and nutritious ingredients? 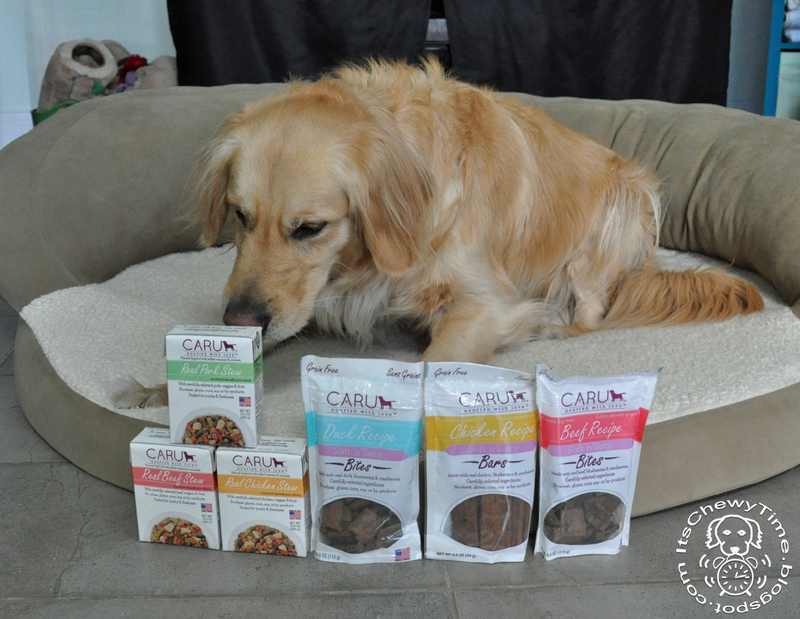 I often do, and Caru's line of Natural Stews fits those criteria to a T.
Caru Pet Food is a family-owned company inspired by a Golden Retriever named Karu (and I am obviously very partial to Goldens!). 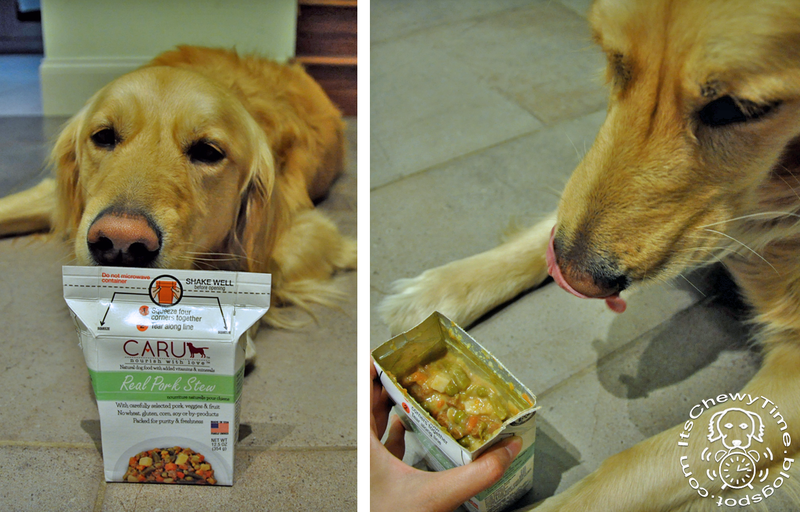 Karu's parents began cooking a homemade diet for him in hopes of ending a vicious cycle of ear infections, and their positive results led to the creation of Caru (read the full story here). Chewy had a real serious case of the hungry eyes for the stews. There are 4 flavors of Caru Natural Stews: Beef, Chicken, Turkey, and Pork. Each flavor has meat as the first ingredient and contains various nutritious vegetables such as green beans, potatoes, carrots and peas. We tried all of the flavors except for Turkey. 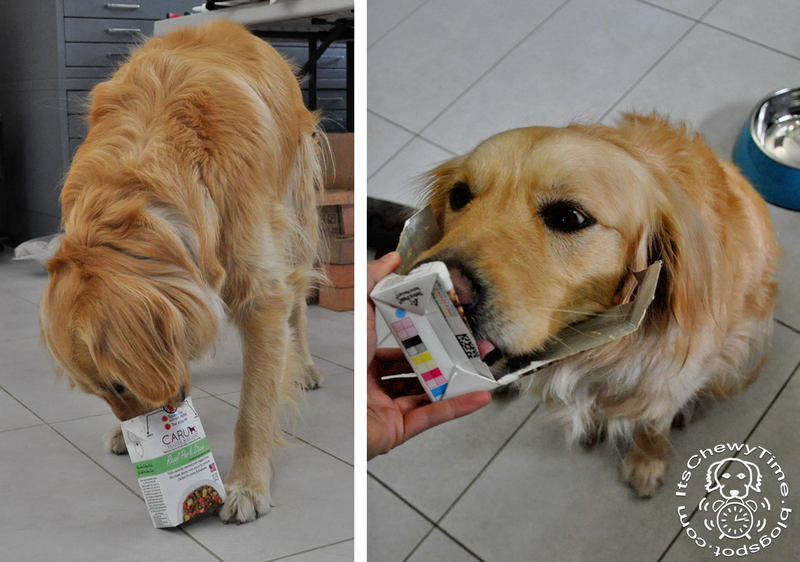 Chewy was very interested before I even opened the cartons, as evidenced by his sniff-sniffing and dopey-smiled "I'm a good boy!" sitting. Despite Chewy's difficulties, the BPA-free Tetra-Pak carton is very easy to open if you've got thumbs. It even has how-to instructions right at the top. You squeeze the corners to make the top pop up, and then rip along the perforations- no scissors needed! The stews look kind of like chicken pot pie filling. To me, the beef stew has the aroma of a nice beef stew for humans and the chicken stew smells like Progresso chicken noodle soup, but the pork stew reminds me of typical canned pet food (odor-wise). To Chewy, they all smelled great. Chewy thinks it is delicious in ALL forms. 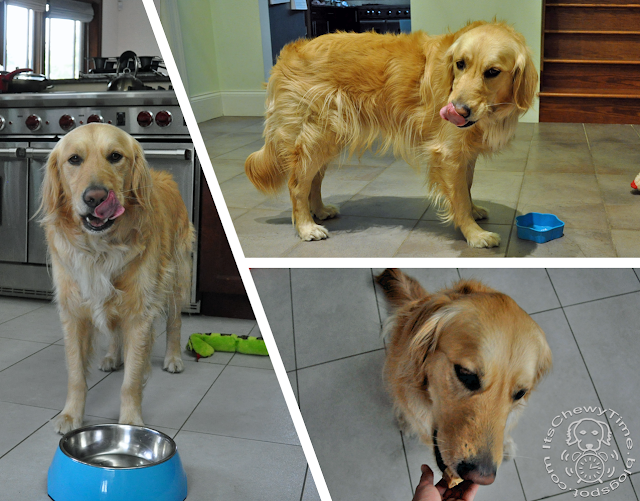 There is always lots of chop-licking and triple/quadruple-checking that he completely emptied his bowl. If not using a whole carton of stew at once, the packaging makes it easy to store. You just fold the flaps back down, place it in a ziploc bag to prevent drying out (optional), and put it in the fridge (for up to 3 days). Chewy always volunteers to clean any stew drippage on the outside of the box. Putting it away? But I want more! When you take it out of the fridge, it has the appearance of a really saucy meat + veggie dish. I'm sure Chewy would eat it cold if I let him, but I, personally, think cold potatoes are not yummy. A quick pop in the microwave makes it look more like a stew. Be sure to let it cool before serving! When we finish a carton of stew, I let Chewy clean out the box. It's like a bonus treat dispensing toy is included! This can occupy him for awhile because his nose is too wide to get all the way to the bottom, but eventually I rip or cut open the box for him. There isn't a sharp edge on the Tetra-Pak carton like with metal cans, so Chewy can lick it to his puppy heart's content. Once emptied, the cartons can be recycled. 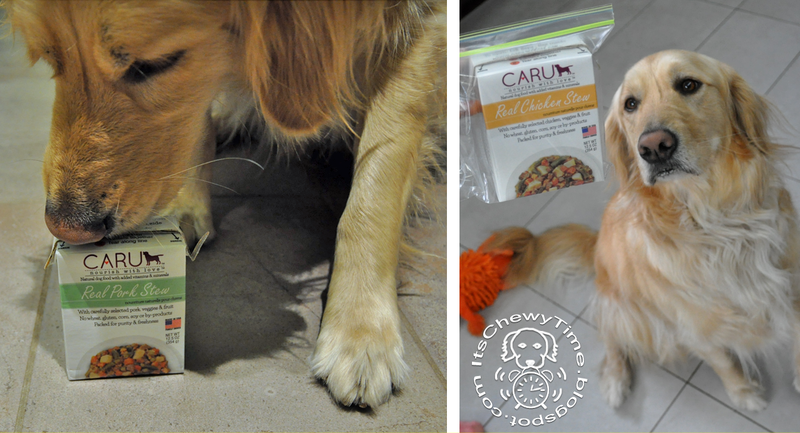 Chewy gives 4 enthusiastic paws up for Caru stews. I like that they are made with human-grade, natural ingredients, come in easy-to-use packaging, and can be served in different ways. Chewy thinks they are tasty and smell scrumptious, and appreciates an alternative to dry kibble (I think). 4 happy paws up for Caru stews! More stew please? Pretty please? 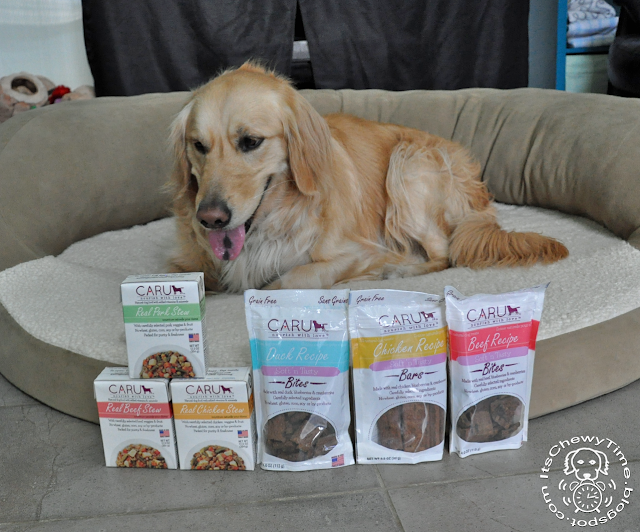 Disclaimer: We received one each of Caru Pet Food Company's Real Beef Stew, Real Chicken Stew, and Real Pork Stew in exchange for an honest review. We did not receive any monetary compensation for this post, and all opinions stated above are our own. Gosh, this stew sounds great! All of a sudden I'm starving! 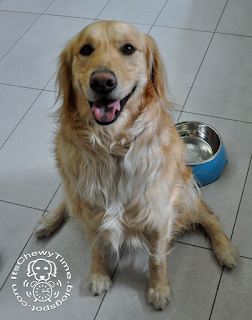 (c) 2014-2015, It's Chewy Time. Simple theme. Powered by Blogger.